Thank you for your interest in 5th Room Unfortunately 5th Room is no longer on the market, having been superseded by Studio Acoustics, at the following address: http://www.studioacoustics.com.au/. If you wish to have a product serviced from 5th Room, please submit a support request and choose "service - repairs" from the list. Following the changing way that people are experience their music the 5th room Lifestyle Audio brand was developed by TDJ for the Bunnings warehouse stores with the intention to expose the typical Bunnings customer to the idea of outdoor audio as a home improvement item for their alfresco patio lifestyle area. The range consists of in ceiling and Out door and Wireless speaker systems with an impressive array of installation accessories to go with it including in wall volume controllers, Switch boxes and wall plates. Over recent times we have seen an increasing number of people making the choice to spend more and more time enjoying living spaces out side the home. And why not? There is something about the blue sky, the fresh air and the smell of the garden that enhances the enjoyment of every activity over indoor activities. So it stands to reason that people are changing the way that they think about their out door living space. Gone are the days where a patch of grass and a twin burner gas BBQ were enough to satisfy our lifestyle needs. Because we now spend so much time enjoying our outdoor areas we now see families and individuals thinking of these living places as an integral part of their home. In fact these outdoor living spaces are now known as the"Fifth room" of ones home. At 5th Room we firmly believe that this 'room' should be treated with the care that any other room would have when being furnished and designed. The Fifth Room outdoor lifestyle entertainment range enables you to achieve a soundscape of varying size and power to suit the individual or families taste and lifestyle choice. Our specialized outdoor audio equipment ranges from the very small, to the very power full and elegant. 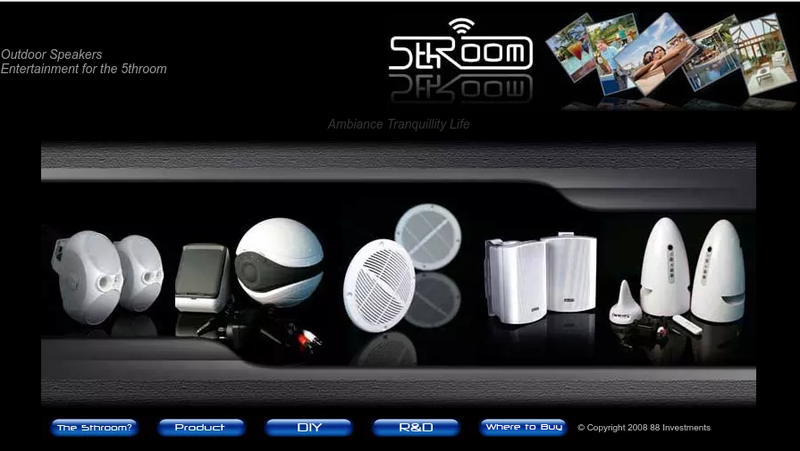 The 5th room range is a one stop complete solution that includes all the gadgetry and accessories needed to complete your installation. Whether you're a Party go'er or someone that likes some background music whilst spending time in the garden, 5th room has a system to complement your life style.